When I first started writing about x86 CPUs Intel was on the verge of entering the enterprise space with its processors. At the time, Xeon was a new brand, unproven in the market. But it highlighted a key change in Intel's strategy for dominance: leverage consumer microprocessor sales to help support your fabs while making huge margins on lower volume, enterprise parts. In other words, get your volume from the mainstream but make your money in the enterprise. Intel managed to double dip and make money on both ends, it just made substantially more in servers. Today Intel's magic formula is being threatened. Within 8 years many expect all mainstream computing to move to smartphones, or whatever other ultra portable form factor computing device we're carrying around at that point. To put it in perspective, you'll be able to get something faster than an Ivy Bridge Ultrabook or MacBook Air, in something the size of your smartphone, in fewer than 8 years. The problem from Intel's perspective is that it has no foothold in the smartphone market. Although Medfield is finally shipping, the vast majority of smartphones sold feature ARM based SoCs. If all mainstream client computing moves to smartphones, and Intel doesn't take a dominant portion of the smartphone market, it will be left in the difficult position of having to support fabs that no longer run at the same capacity levels they once did. Without the volume it would become difficult to continue to support the fab business. And without the mainstream volume driving the fabs it would be difficult to continue to support the enterprise business. Intel wouldn't go away, but Wall Street wouldn't be happy. There's a good reason investors have been reaching out to any and everyone to try and get a handle on what is going to happen in the Intel v ARM race. To make matters worse, there's trouble in paradise. When Apple dropped PowerPC for Intel's architectures back in 2005 I thought the move made tremendous sense. Intel needed a partner that was willing to push the envelope rather than remain content with the status quo. The results of that partnership have been tremendous for both parties. Apple moved aggressively into ultraportables with the MacBook Air, aided by Intel accelerating its small form factor chip packaging roadmap and delivering specially binned low leakage parts. On the flip side, Intel had a very important customer that pushed it to do much better in the graphics department. If you think the current crop of Intel processor graphics aren't enough, you should've seen what Intel originally planned to bring to market prior to receiving feedback from Apple and others. What once was the perfect relationship, is now on rocky ground. The A6 SoC in Apple's iPhone 5 features the company's first internally designed CPU core. When one of your best customers is dabbling in building CPUs of its own, there's reason to worry. In fact, Apple already makes the bulk of its revenues from ARM based devices. In many ways Apple has been a leading indicator for where the rest of the PC industry is going (shipping SSDs by default, moving to ultra portables as mainstream computers, etc...). There's even more reason to worry if the post-Steve Apple/Intel relationship has fallen on tough times. While I don't share Charlie's view of Apple dropping Intel as being a done deal, I know there's truth behind his words. Intel's Ultrabook push, the close partnership with Acer and working closely with other, non-Apple OEMs is all very deliberate. Intel is always afraid of customers getting too powerful and with Apple, the words too powerful don't even begin to describe it. What does all of this have to do with Haswell? As I mentioned earlier, Intel has an ARM problem and Apple plays a major role in that ARM problem. Atom was originally developed not to deal with ARM but to usher in a new type of ultra mobile device. That obviously didn't happen. UMPCs failed, netbooks were a temporary distraction (albeit profitable for Intel) and a new generation of smartphones and tablets became the new face of mobile computing. While Atom will continue to play in the ultra mobile space, Haswell marks the beginning of something new. Rather than send its second string player into battle, Intel is starting to prep its star for ultra mobile work. 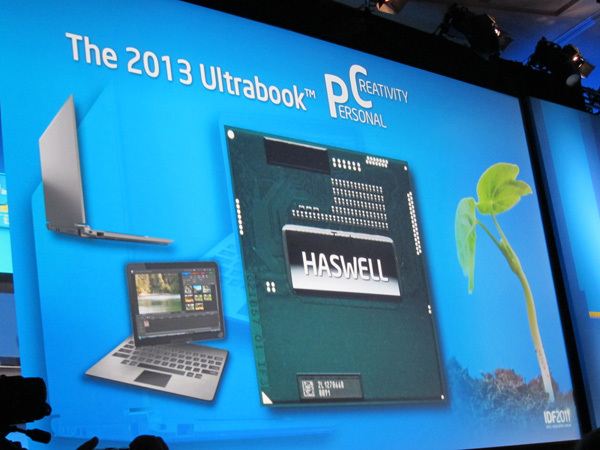 Haswell is so much more than just another new microprocessor architecture from Intel. For years Intel has enjoyed a wonderful position in the market. With its long term viability threatened, Haswell is the first step of a long term solution to the ARM problem. While Atom was the first "fast-enough" x86 micro-architecture from Intel, Haswell takes a different approach to the problem. Rather than working from the bottom up, Haswell is Intel's attempt to take its best micro-architecture and drive power as low as possible. Couldn't agree more, this article really brightened up what was otherwise a pretty miserable afternoon here in London.